If Clothes Could Talk - Updated for Season 10! Yes, yes, I'm nearly a whole season behind - but still, rejoice! Season 10 has now been added to the Clothing Catalogue. View the S10 clothes and find out which of Dean's Murder Shirts he actually does the most murdering in! This is always my favourite chart to do (so far). In S10 we see Dean favouring newer wardrobe, and perhaps phasing out his old shirts and jackets from the early seasons. Meanwhile, Sam, like in S9, is favouring clothes from S2/3 and S6/7. Pretty much the usual here! Here's where it gets interesting! Dean, primarily, where's NEW clothes in S10. 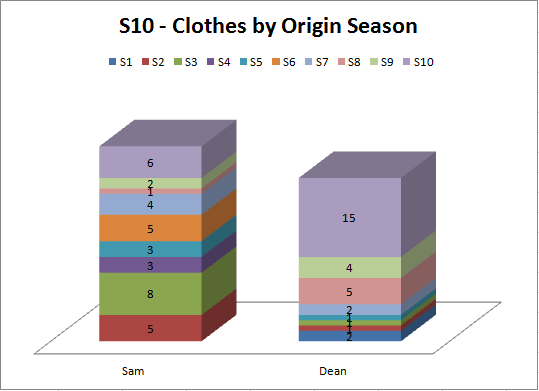 I didn't count the number of INSTANCES of him chosing a new shirt over an old one - but I wouldn't be surprised if it's as close to a 50/50 split as it is in this chart, that basically just shows that nearly half of the wardrobe Dean carried around with him in S10 was new. 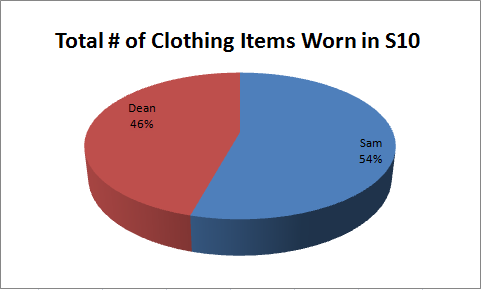 Meanwhile, Sam didn't have nearly as many new clothes as Dean did. 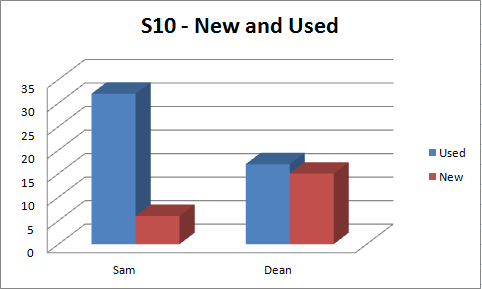 Usually, those stats are reversed - so Sam's clothes budget must have gone to Dean's wardrobe this year. Dean also remains a jacket fan (snigger), with 4 new jackets/coats this year, in comparison to Sam, who had no new jackets or coats at all (which isn't too unusually, Sam didn't get any new jackes in S4, 5, or 8, either. Again, we see the Dean wearing the greater variety of coats and jackets. 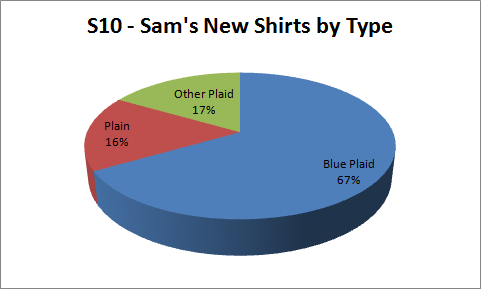 Sam remains a fan of having fifty billion different blue plaid shirts... so, nothing new here. Except that for the first time (I believe), Dean is the only one who appears in a hoodie - it happens only once, but it's still a pretty rare event. I love this chart! It makes a perfect peace sign - very much in contrast to the MoC!Dean that we had all season, who, even in his new shirts, favoured Plaid and dark colours. Even the new green shirt is a dark green shirt, as opposed to the lighter grey-greens that Dean usually wears - but I still counted it as green. And there you go! Hope you enjoy. I'm actually not surprised! Jared has dropped some weight, so I'm thinking they must fit him better than they did when he was wearing them S4-S6! So which murder shirt does he do the most murdering in? The Red Carhartt? or is there another that people don't actually associate with murdering!Dean? Well, between the two that fandom nicknamed "the murder shirt" - it's the red carhartt. In actuality, it's probably the "dark-buttoned grey/green" shirt - mainly because he's a)had it for longer, and also b)slaughters all the Stynes while wearing it. BUT... as demon!dean, he favoured the red carhartt. I thought maybe there was another :D That red carhartt looks awesome though. Seriously, I'm glad other people enjoy this. What an accomplishment!! This is SO amazing. THANK YOU, as always, for doing the legwork on this for those of us who want to know, but don't quite have the same drive to figure it out. ;) Love love love it. I KNEW Dean was wearing more plaid this season! I feel like his plaid started to increase in seasons 8 and 9, and then exploded in season 10. In the early seasons, I feel like it was RARE to see him in visible plaid (unlike Sam). 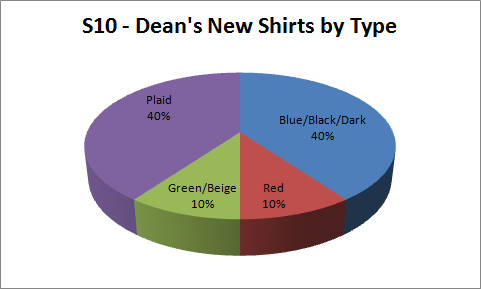 We just recorded the "No Exit" episode of the Plaidcast, and I said something about Dean's red shirt being the one that he wears a lot as Demon Dean...because I don't have the same nuanced eye that you do for shirts. ;) How do you distinguish between the "S2 Red Shirt" and the "Red Carhartt Shirt" (using your names for them)? To my untrained eye, they look the same! Dean is definitely wearing more plaid. IMHO, I think it started around S7, when I'm 90% sure that SPN got a new head of costumes. It did indeed use to be a very rare event for Dean to wear plaid. He had his blue plaid and his two brown plaid shirts, and he's wear them once or twice per season, and I think that was it for the first 5-6 seasons. How do you distinguish between the "S2 Red Shirt" and the "Red Carhartt Shirt" (using your names for them)? To my untrained eye, they look the same! Pocket stitching. 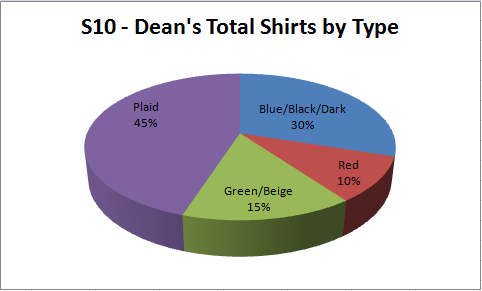 That is like 90% of it when it comes to Dean's plain shirts. In the case of the Carhartt versus the S2 shirt - the breast pockets of the S2 don't have flaps. The Carhartt does. On other shirts or jackets, I might be able to only tell them apart by the SHAPE of the pocket flap - ie: is it pointed or straight? Does it have square edges or rounded? - on some of his green shirts, I actually do have to look at the stitching itself, are they single or double seams? Are there odd decorative seams that don't appear to have a function? Stuff like that. Most shirts that I call "scruffy" or "rugged" have multiple-seams on the pockets, which give the shirt a more "work shirt" feel, rather than single seamed shirts that could arguably cross the line into dress-shirt in a pinch. There were two shirts in the early seasons that I actually had to be able to see the shoulder stitching in order to tell them apart from other shirts... and since Dean sometimes never takes off his coat, that led to a lot of entries of "this MIGHT be the shirt..."
The Carhartt shirts are particularly easy to tell apart form other shirts, because wardrobe doesn't remove the leather brand label that Carhartt puts on the top corner of the left-breast pocket flap. Whereas, wardrobe WILL remove the Levi's label from all Levi's shirts. That policy will ALWAYS stand!! I love talking about episodes, it doesn't even matter how long ago I might have watched them - I mean, I might need to read my own entry as a refresher about what I said, but I'm still happy to discuss at any time!! And YES TO "RED MEAT" BEING AWESOME! Man, that was just... everything. Everything I love about Supernatural all in one episode that literally gave me anxiety for the entire episode. Anyway, you can go comment to your hearts content. These graphs are so cool. It's interesting to note that Dean wore 2 shirts still from Season 1. I'm also like the fact that Dean isn't wearing as much green these day. In the earlier seasons it seems all he ever wore was that faded green, which I just hated. But the fact he is wearing more plaid is especially interesting, since that was more Sam's thing in the early seasons. While Sam is still more plaid for the season, Dean is closer to matching him this year. Thanks for doing all this. 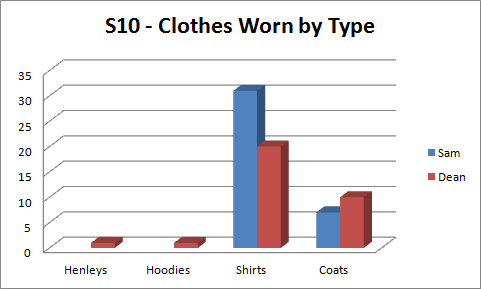 I love comparing clothes and what they wear from episode to episode; season to season. Thanks! I'm glad you like the graphs. I love making them, even though some of them don't ever change much year to year. Those faded green shirts would look amazing on Jensen IN PERSON, but on camera, with the filters they use, I don't think they have the same effect - I like Dean more in dark blues and burgundies. The purple plaid shirt this year was really nice too.